Most websites use "web safe" fonts which are fonts installed on all computers. However there are hundred or thousands of more interesting typefaces which you can now use with your Wikidot site. There are two ways to use other fonts, either from Google WebFonts which has over 500 available or a slightly more complex method from Font Squirrel if the font you want is not on Google Web Fonts. 1. Find the font you want to use and click on the Add to Collection button. 2. Click the Use button in the bottom right of the screen then scroll down. 3. If there are a number of different variations check the checkboxes next to the one(s) you want to use. for example @import url(http://fonts.googleapis.com/css?family=Architects+Daughter); to your main CSS. in your main CSS the @import rules must before all other CSS rules. What this means is that for the page title the Architects Daughter font will be used, but if for some reason the google webfonts api is not working then the web safe font of cursive will be used instead, so there is a falback. If the font you want to use is not available at Google webfonts you can use fonts from Font Squirrel or upload your own fonts there and generate the code to you in your own site. It works well but is more complex than Google webfonts. 2. select the Expert option radio button. 3. Select the base64 encode checkbox. 4. Then upload the font you want to use. Once you have checked the agreement checkbox click on the Download Your Kit button at the bottom. It will download a zip file to your computer containing several font files and a CSS stylesheet. Upload the font files to the css page on your computer and copy the css from the stylesheet to a different page on your site inside [[code type="css"]] .. [[/code]] tags. It needs to be a on a separate page because the css code is very long and you risk exceeding the 200,000 character limit if you put it into your main css page. You can put the CSS code downloaded from Font Squirrel into a css module on your page. This is not ideal as the code is very long and you will risk exceeding the 200,000 character limit on the page. * the font for the top bar menu is "FGJayne" and was generated at Font Squirrel. The CSS for that site where you can see how the fonts have been used in the CSS is at http://gtr.wikidot.com/css:theme. You will see that the FGJayne font generated at Font Squirrel is imported into the main css from its own page on the site which holds the font files and the font code. Another example is http://www.wdeditor.com where Shane ( leiger) has used the Pontano Sans font from Google Web Fonts to good effect. Chrome supports TTF and SVG. Love this article Rob! Embedding fonts is a very exciting web innovation that we should all take advantage of. Small request: Could you please give us an example of a non-standard font working in action? That would be cool! 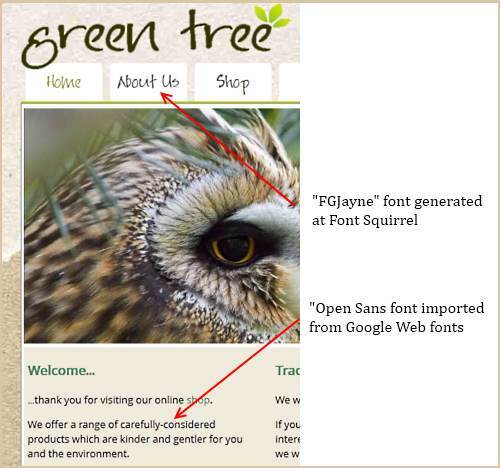 I have added a link to a live example at http://gtr.wikidot.com where the normal text, headings etc are imported from Google Webfonts and the top bar menu font was generated at Font Squirrel. Shane's site at http://wdeditor.com also makes good use of the Pontano Sans font imported from Google Web Fonts. Well thank you kind sir. Well I got it working on my wikidot site, but I was hoping you could also print it. Bummer for now, even your greentea site… if you print it the typeface is gone. We have to investigate on this and extend the tutorial if it is also possible to print. How to apply a font to everything on a site? The changes in the CSS seem specific. The font does not appear in 'Table' or 'bulleted points 'environment, for example. Is there a way to use a font everywhere on a site? The font does not appear in 'Table' or 'bulleted points 'environment, for example. No it won't if you have just applied the font to specific elements, as I did in my example to the headers. If you want the same font to be used everywhere on a site or category then add a html * rule at the beginning of your CSS and make sure there are no font-family properties anywhere else in your CSS. You can the result of that at http://vineyard.wikidot.com/client:peter-gabriel where everything has been set to the Open Sans font.